The U.S. has tons of cities that are worthy of the title "music city." But as the birthplace of jazz, a musical style that gave birth to so many others, New Orleans reigns supreme. Each spring, around the end of April to early May, the city is host to the New Orleans Jazz and Heritage Festival, also known as Jazz Fest, which is one of the biggest jazz festivals in the world. Jazz Fest features a wide variety of music, including gospel, blues, rock, and indigenous Louisiana music, such as Zydeco. Of course, the festival also showcases traditional and contemporary jazz acts. Lasting for 10 days, over two weekends, Jazz Fest and is a chance to sample the spirit of the New Orleans' music scene all at once. Of course, visitors to New Orleans need not wait until Jazz Fest to enjoy live music in New Orleans. 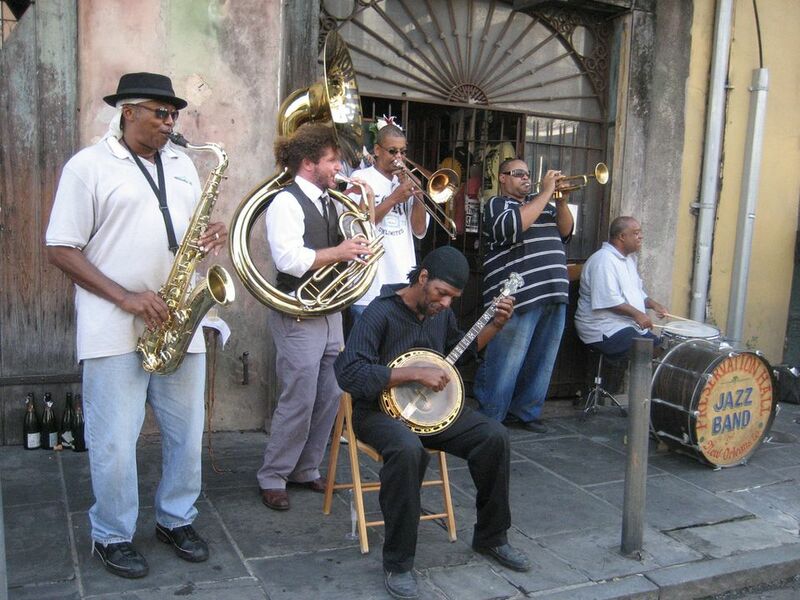 From street musicians and funeral bands to big music clubs off of Bourbon Street, music is at the heart of everyday life in The Big Easy. The great city of Chicago has music venues for every taste, but it is particularly known for the Blues. The "Chicago Blues" style came about in the post-World War II-era when many African-American southerners moved to the industrial north in search of jobs. They took with them the musical styles of the Mississippi River Delta but imbued this music with a more "full-bodied sound" by using electric, rather than acoustic, equipment. The most famous names in Chicago Blues are Muddy Waters, Howlin' Wolf, and Buddy Guy, to name a few. Today, the best place to enjoy the Chicago Blues in Chicago is at the Chicago Blues Festival, which takes place in early June. Like Chicago, Memphis has the Blues. Beale Street is the most famous and most musical street in Memphis, and it is where you will find most of Memphis' best live music venues. In addition to a healthy tradition of live music, Memphis has Elvis. Elvis Presley recorded his very first song ("That's Alright, Mama") in 1954 at Memphis' Sun Studio, which became, for all intents and purposes, the birthplace of Rock 'n' Roll. While Elvis went on to become the world's first true rock 'n' roll star, he kept his home in Memphis, living at a total of nine different addresses around town. His most famous home, of course, is Graceland, Memphis' most visited attraction. The state of Tennessee is not only home to Memphis and Elvis but to the city of Nashville. Nicknamed "Music City USA," Nashville is the epicenter of country and western music in the United States. The most famous of Nashville's musical legacies is the Grand Ole Opry, a country music and variety radio show that is still recorded live. Visitors to Nashville can attend a live recording of the Grand Ole Opry at Ryman Auditorium, one of Nashville's most historic music venues. Modern Nashville still hums a country music tune, with music museums, live music concerts, songwriters clubs, and a Music Walk of Fame all contributing to make sure Nashville retains its nickname. The home of popular music festivals like South by Southwest and the Austin City Limits Festival, as well as the largest public university in the country (the University of Texas, like most colleges, is a breeding ground for creative music talent), Austin has earned the moniker "Live Music Capital of the World." No musical genre defines Austin, though it has a tradition of churning out rock and indie darlings. Musical artists who have earned their chops playing in Austin include Stevie Ray Vaughan, Janis Joplin, Joe Ely, and Spoon. Seattle, Washington, has been a musical city for decades (Jimi Hendrix hails from here), but it didn't start getting the recognition it deserved until the early 1990s when grunge music disrupted the scene. The "Seattle Sound" forged by Pearl Jam, Soundgarden, and, in particular, Nirvana, brought worldwide attention to Seattle and the city has remained a major player in launching indie and alternative music acts. As for music attractions, Seattle is known for its many concerts and live music venues. The Experience Music Project, also known as the Museum of Pop Culture, is also a draw for musically-inclined travelers, as the museum regularly hosts exhibits on music and pop culture topics. It's also noteworthy to mention Olympia, Washington, when discussing the grunge, punk, and indie music scene of Seattle. The Washington capital, located about one hour from Seattle, has a thriving underground scene. Detroit is synonymous with Motown, both a highly successful music label and the name of the music that it produced. A large majority of the gospel-inspired R&B singers and groups that populated the radio waves in the 1960s cut their records on the Motown label. The Temptations, The Four Tops, The Supremes, Smoky Robinson and the Miracles, and Stevie Wonder to name just a few all created hit songs for Motown, forever linking Detroit with this very popular musical style. Visitors to Detroit interested in the Motown sound can visit the Motown Museum. Music is integral to the dominant Latin American and Caribbean culture in Miami. There are live music clubs all over the city from South Beach to Downtown Miami to Calle Ocho, also known as Little Havana. Additionally, Miami's perpetual warm weather makes it an excellent city for outdoor concerts. As for musical styles in Miami, look to Latin Jazz, a lively genre popularized by Gloria Estefan, one of Miami's most famous residents. Miami is also the site of the Latin Recording Academy, organizer of the annual Latin Grammy Awards. Where Should You Visit in the Southern U.S.?